Lauren is this week's hostess, and our challenge was to create something about candy, using candy, anything CANDY! So I used Beate's tutorial and made a Pull Treat. It was really easy and turned out cute! And DH can finally eat the chocolate that's been sitting around here this week, lol! 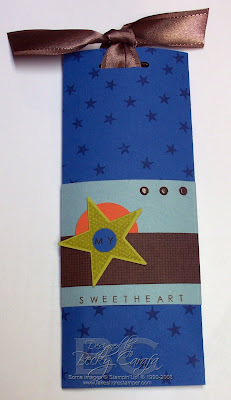 Since it was for him anyway, I went with my old standby star theme to make it not girly. These are a few of SU! 's new In Colors - they are gorgeous! Thanks for stopping by! I hope you get a chance to play along, post your submission on the Stamp Something blog and check out the rest of the team's samples! oooo, as always love what you came up with Becky. You did fabulous work with the In Colors (that choc. satin ribbon looks great!) So cool that you stamped on the button. Great idea Becky! Love the colors and the star accent. Fun! These would be great as party favors! :) Have a great weekend. Oooh, how yummy Becky - I love this!! The new colors ARE fabulous, I am having a blast playing!! Wonderful project this week, girl, YOU ROCK! This is wonderful lBecky!! Great color combo, I can not wait to use it!!!!!! Wonderful job with the challenge, as always. HAve a fantastic weekend! Very fun! I really love the new In Colors you used. This is awesome Becky! I love the colors! Love that star too =). TFS! I thought about doing this exact something, and then promptly forgot! Maybe I need to try some Ginko Biloba because I think the same thing happened to me last week!! LOL!! Fabulous job on the treat holder.....I'm so going to do one! Oh, I love the combo with the new colors and they look great on this fun project! Hope your husband enjoys the chocolate! How cute! Love this! The star motif is awesome! How fun! I love those colors and that star!